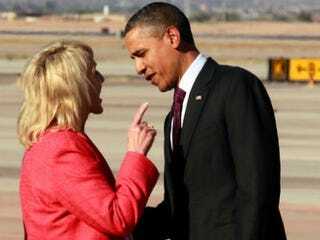 President Obama arrived at Phoenix-Mesa Gateway Airport in Arizona yesterday and was met by one unhappy person: the state's Republican governor, Jan Brewer, the Arizona Republic reports. In what was described as an animated discussion, Brewer and Obama went head-to-head over her book, Scorpions for Breakfast. They were both talking over each other at various points when Brewer pointed her finger in the president's face. He then walked away in what appeared to be the middle of their conversation. The White House said that during the encounter, Obama said he was looking forward to continuing to help the state's economy grow, but he felt that in her book, she'd given an inaccurate depiction of her previous meeting with him in the Oval Office. "He was a little disturbed about my book, Scorpions for Breakfast," Brewer told a pool reporter who is a member of the traveling White House press corps shortly after her encounter with Obama. "I said to him that I have all the respect in the world for the office of the president. The book is what the book is. I asked him if he read the book. He said he read the excerpt." Asked what aspect of the book disturbed him, Brewer said, "That he didn't feel that I had treated him cordially. I said I was sorry he felt that way, but I didn't get my sentence finished. Anyway, we're glad he's here." Asked later about the photo and her finger-pointing, Brewer said she would never disrespect the president. We beg to differ. Brewer's gesture is a clear reflection of her lack of respect for the current president, and symbolic of what her party thinks of him. From what we can see, Obama remained poised while Brewer seemed to be trying to act tough in front of the cameras. We're glad that the president kept his cool. With nine months left until re-election, he knows what's at stake and what he can and can't do.